Welcome to the kick-off for my Everest 2017 coverage! I have already posted a few articles on 2017 but let me officially welcome you. This will be my 16th season of all-things Everest: 10 times providing coverage, another 4 seasons of actually climbing on Everest and two years attempting Lhotse. I did similar coverage for the 2004, 2005, 2006, 2007, 2009, 2010, 2012, 2013, 2014, 2015 and 2016 seasons. I summited Everest on May 21, 2011 and have attempted Everest three other times – 2002, 2003, 2008 and Lhotse in 2015 and 2016. If you are one of my 2 million regular readers, hello again, if you are new, welcome! My goal is to provide insight and analysis of what is going on up there with no favorites or agendas. I use sources directly from the mountain, public information and my own experiences to write my posts. Usually I post once a day as the season gets started in early April and ramp up to almost hourly coverage during the intense summit pushes in mid to late May. I spend several hours a day to create these updates. You can sign up for (and cancel) notifications on the lower right sidebar or check the site frequently. Perhaps the most dramatic year since 1996. A lack of snow combined with high winds created dangerous rockfall on the Lhotse Face causing many injuries primarily to Sherpas before the route was moved to a safer passage to Camp 3. However, these dangers plus the deaths of three Sherpas early in April from multiple causes, caused the Sherpas from Himex to lose confidence. Russell Brice, arguably the most famous of the Everest commercial operators, cancelled his entire Himalaya spring season (Everest, Lhotse and Nuptse) taking over 100 people off the mountain. It was an unprecedented decision. For many climbers, they accomplished a lifelong dream, returned safely home to a family who have started to breath again. With an unparalleled lifetime experience, for some their lives were changed forever. Read my season recap here. So what will 2017 bring? These are my thoughts. Look for record summits where many, many people accomplish their lifelong dreams but also look for disorganization on both sides due to new operators and inexperienced climbers. With many small Nepali based operators continue to compete on price, there could be more inexperienced climbers than ever. This means disorganization, slow teams, crowds, frostbite and chaos. And with some helicopter companies working with independent film crews offering free rescue flights in exchange for a TV appearance, a serious false sense of security is emerging, especially with inexperienced climbers and poorly staffed guides. The entire Everest helicopter industry needs urgent review. Potentially there could be more deaths than the average 5 per year since 2000. With last year’s huge numbers on the Nepal side, some operators are moving to Tibet. While this side has been traditionally uncrowded, the features of the 1st and especially the 2nd Steps on the summit push are already notorious for traffic jams and crowds. Add in another hundred climbers and you have the same scenario as you fear on the Hillary Step. As always, the key to dealing with the crowds is to get out early and climb fast. Stepping back, I believe 2017 could be a record summit year for several reasons. Long time Western operators are reporting close to capacity teams. I am hearing from many individuals about climbing with small Nepali operators and the middle class of India is showing interest in Everest like never before. The traditional markets of North and South America, South Pacific, Western Europe and Russia are as strong as ever plus many are wanting to use their permit extensions issued by China and Nepal due to avalanches and earthquakes in 2013 and 2014 before they expire saving them thousands of dollars. In the autumn of 2016 summits, Manaslu saw record summits and there was high traffic on Cho Oyu. These peaks are often used as the final peak before going to Everest. Also, after the tragic seasons of 2014 and 2015, 2016 was a relatively safe season thus giving many people the false confidence that 2017 will also be safe. Finally, the Chinese are telling Nepal operators that they will limit the number of foreign (non-Chinese) climbers in Tibet in the autumn of 2017 because of “a large meeting held in Tibet at that time.” This may encourage some climbers to jump on the Everest train rather than wait. They are saying no more than 50 on Cho Oyu and none for the other peaks including Shishapangma and Everest. Check with your operator BEFORE sending any money and get cancellation insurance if you do. I hope I am wrong on the chaos but the crowds look certain. Operators will have to work together like they never have to have a safe and orderly season plus there must be over 10 days of suitable summit weather to spread out the climbers. As I covered in my annual “How much does it cost to climb Mount Everest” post, look for prices to be higher overall but still deals to be found attracting experienced climbers. The headline for 2017 is that all expedition prices crept higher but climbing from China saw a huge 22% increase. The permits for a medium size team of four or more climbers increased from $7,000/climber to $9,950/climber or 34%. The price range for a standard supported climb ranges from $28,000 to $85,000. A fully custom climb will run over $115,000 and those extreme risk takers can skimp by for well under $20,000. Guided climbs on Everest is like any competitive marketplace driven by supply and demand and the demand is huge! As I’ve noted for years now, more and more Everest climbers are coming from India and China adding to the historic demand from the Americas, Europe and Southeast Asia. 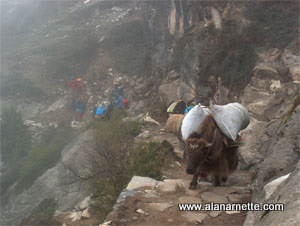 Meeting that demand are many Nepal based guides. China is making huge moves to capitalize on the tourist demands from their own country which will add to the crowding. With this year’s permit increase they are paving the way to reduce the price difference with Nepal. Bottom line: Look for Everest to become more crowded and more expensive over the next five years. I use the Himalayan Database as my primary source of Everest summit statics. If you are climbing in 2017, they are asking you to fill in an electronic web-based survey. This replaces the time consuming process of visiting each team in their hotel before the climb. Please use this link to complete the survey. Thanks for the lively coverage Alan. I am off on my 1st EBC trek this month-end, the 1st of hopefully what will be a long relationship with the Himalayas.Your blogs came across as being the most informative.. Thanks for the coverage, Alan!